A Project Management Office (PMO) can be a complicated entity, and many organisations find that one of the largest issues that arises initially is the allocation of resources. Finding the right skills at the right time coupled with the optimal budget and number of people needed to establish a PMO is hard. Resourcing a PMO is subject to the unique culture and needs of each individual business and changes as the PMO evolves, making guidelines largely irrelevant. The size of the organisation is one of the factors in the amount of human resources dedicated to a PMO. 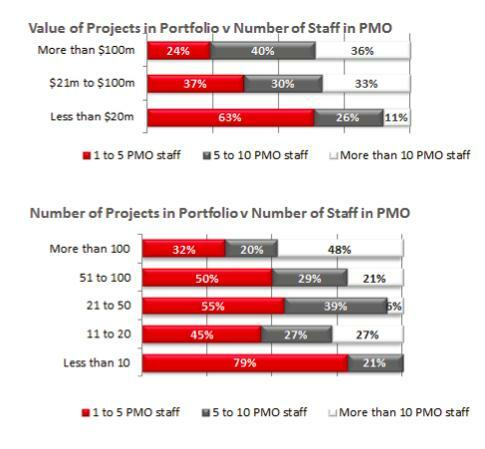 Source: The 2012/13 Project Management Office (PMO) Survey conducted by PM-Partners group. In larger organisations (greater than 5,000 employees), the distinction between size and number of PMO staff becomes less clear, again indicating that the scale of the PMO is very dependent on the individual organisation. The size of a PMO also depends on the services it will need to provide, the number of projects, scale and complexity of projects and their subsequent value to the organisation, and whether project managers report directly into the PMO, or to a business unit line manager. Organisations often choose to resource or increase the size of their PMO by reallocating staff from other areas of the business. Whilst this can solve immediate resourcing issues, it can often lead to ineffective project outcomes unless the seconded staff have appropriate capability in project, program and portfolio management. As a general rule, a smaller group of carefully selected project professionals is often the best solution when resourcing a PMO. Contact PM-Partners group to discuss how a focus on resource allocation can ultimately drive the value the PMO creates within your business. PM-Partners group delivers more than $1B of projects each year and manages a team of over 100 project professionals, consultants and facilitators. With 17 years’ experience in managing small and large scale projects we know how to match people and their skills with project requirements.